Just because a clause in your agreement purports to grant you a certain right doesn't mean a court will be obliged to enforce it. And this rule is particularly important when considering the context of non-compete agreements. Because these agreements typically contain boilerplate language in the (former) employer's favor whereby the employee (supposedly) acknowledges that she has been granted access to all kinds of confidential intellectual property and client information, and that in the event that she were to wrongfully take such information, that would inherently constitute "irreparable harm" that would entitle the employer to injunctive relief. In other words, there is a significant chance that this boilerplate clause may not be worth the paper it was printed on. Because the fundamental premise underlying this clause may be absolutely untrue. Simply put, it is rare to find an instance where a plaintiff whose property has been wrongfully taken cannot be made whole through an award of money damages. As a result, the plaintiff will often fail to meet one of the key, threshold requirements for obtaining a restraining order, i.e., that there is no adequate monetary remedy for his particular legal issue. 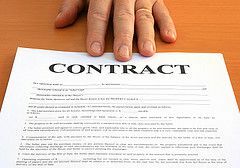 Don't assume that you will automatically be entitled to an injunction if a disloyal employee violates her non-compete clause; you may end up sorely disappointed. Post a Comment to "Why Injunction Isn't Automatic, Even When Noncompete Says So"